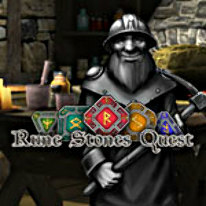 Help save the Dwarven Kingdom in Rune Stones Quest! Help save the Dwarven Kingdom in Rune Stones Quest! Long ago, five Rune Stones protected and brought prosperity to the kingdom. The destruction of these runes by a sinister sorcerer has weakened the kingdom. Meanwhile the Army of Darkness threatens to erase what's left of the declining nation. The Rune Stones must be restored to save the land. The best Dwarven masters have prepared a quest to regain lost ancient knowledge and restore the runes. Will you aid them in their vital quest?